The Foden’s ‘Heritage’ website has been created to celebrate over 100 years of rich and diverse history of the Foden’s Band, a period during which the band have maintained their position as one of the world’s leading ensembles. Made possible with funding from the Heritage Lottery, we have been able to create a digital archive of memorabilia, images, manuscripts and recordings as well as paying tribute to those who have contributed to the band's history. Listen to newly digitised historical recordings made by the Fodens Motor Works Band between 1914 – 43. Additionally, you can hear the band of 2018 perform unpublished works from Foden’s library, as written on the original manuscripts. 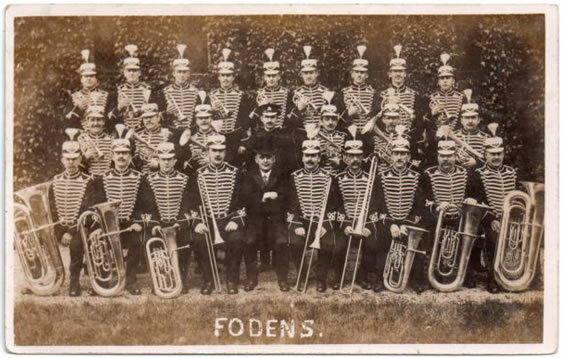 The origin of the Foden’s Band goes back to 1900 when the village of Elworth and Sandbach in Cheshire held a celebration after the Relief of Mafeking during the Boer War. Various local bands including the “Sandbach Volunteer Brass band” and the “Wheelock Temperance Band” took part but were delayed by the generosity of a local landlord who offered them free drinks. Things didn’t quite go to plan as when the bands were due to march to Elworth they decided to take advantage of the free drinks and stayed in Sandbach rather than march to Elworth for the return leg of the march. Outraged at being let down by the bands a group of prominent members of Elworth decided to form their own band for such occasions and so the Elworth Band (Later the ‘Elworth Silver Band’) was formed. View our rich history through various galleries showcasing events, historical artifacts, people and much more!